Length: 3.5 - 4.5mm. Background colour: (1) ‘typical’ form (decempunctata): yellow, orange or red; (2) ‘chequered’ form (decempustulatus): buff, beige, light brown; (3) ‘melanic’ form (bimaculata): purple, dark brown or black. 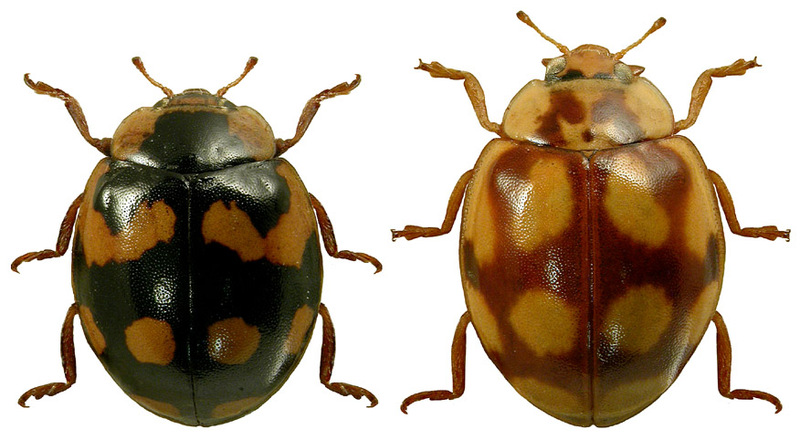 Pattern colour: (1) with 0-15 maroon, dark brown or black spots; (2) with grid-like markings giving a chess-board pattern; (3) with two yellow, orange or red shoulder flashes. Number of spots: 0-15 (10). Spot fusions: common. Melanic (black) forms: various and common. Pronotum: white with 5 dark spots, which may be fused, or dark trapezium mark. 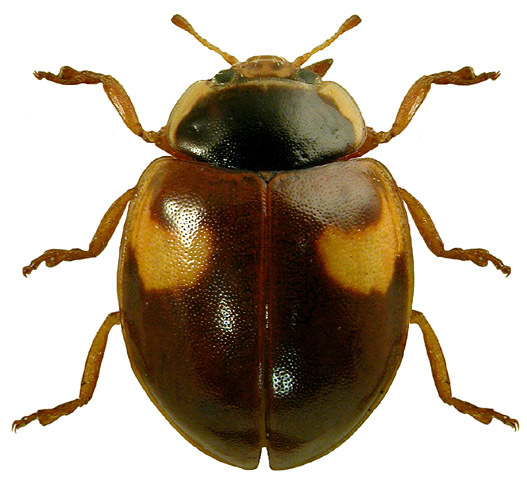 Leg colour: brown (a good feature for distinguishing from 2-spot ladybird, which has black legs). Other features: extremely variable in colour and pattern. Fourth-instar larva: closely resembles larva of 2-spot ladybird; 10-spot larva is pale grey (2-spot larva is dark grey), with a triangle of yellow spots across the first and fourth abdominal segments; outer tubercles on abdominal segments five to eight are pale (dark in 2-spot); fine hairs projecting from tubercles. Pupa: closely resembles pupa of 2-spot ladybird; 10-spot pupa has a black front section but otherwise cream with six rows of dark spots running longitudinally; two orange spots on edges of first abdominal segment and an orange patch in the middle of abdominal segments four to six (2-spot pupa similar but with a darker overall appearance and lacking the orange markings). Habitats: 10-spot ladybirds are more habitat specific than 2-spot ladybirds but still occupy a variety of habitats. 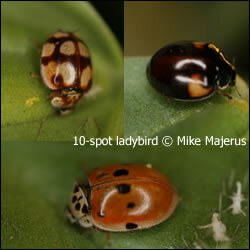 Generally, 10-spot ladybirds are found on deciduous trees and hedgerows. Many 10-spot records are from urban areas where deciduous trees are abundant. Like 2-spot ladybirds, this species can be readily found on mature lime or sycamore trees, for example in parks or churchyards. A number of 10-spot ladybird records are from deciduous and conifer woodlands, scrub and grasslands. There are some records of this species from wetlands and coastal habitats, particularly dune systems. 10-spot ladybirds overlap with a number of other species of ladybird and are commonly found with 2-spot, 7-spot, 14-spot, pine and harlequin ladybirds. 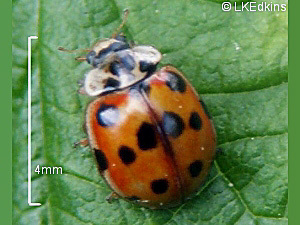 Host plants: Most 10-spot ladybird records are associated with deciduous trees, such as oak, lime, willow, and sycamore. There are records of this species from conifers, including larch and Scots pine. Hawthorn and blackthorn are also common plants on which 10-spot ladybirds are found. However, there are also many observations of 10-spot ladybirds on herbaceous plants such as nettle, hogweed, thistles, rosebay willowherb and fat-hen. 10-spot ladybirds are associated with garden plants, such as roses and buddleja, fruit trees and shrubs, such as blackcurrant and cherry, but less commonly than 2-spots. 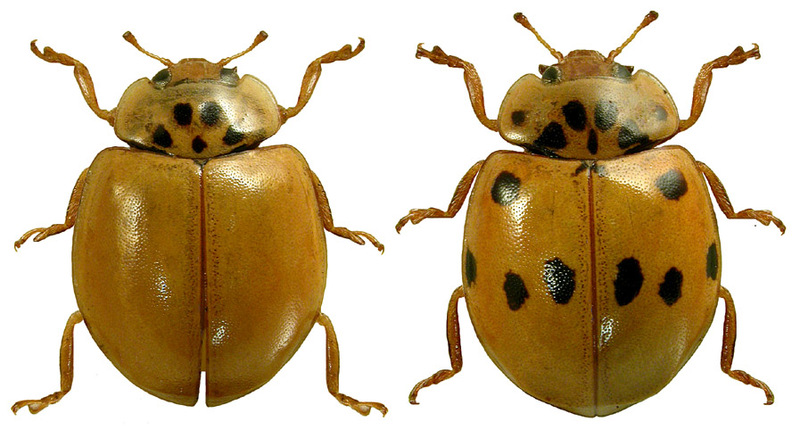 Overwintering sites: 10-spot ladybirds are found overwintering in leaf litter, plant debris and beech nuts.